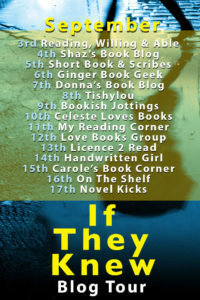 I’m pleased to be reviewing If They Knew by Joanne Sefton today. My thanks to Sabah Khan from Avon Books for the place on the tour and the review copy via Netgalley. I do love a psychological thriller that is centred around family secrets. Barbara Marsden has a past. She’s always been a bit distant with her daughter, Helen, and her husband knows there’s something she’s keeping from him, but she’s built a life for herself and her family and they’ve always accepted it. Then something happens that means that Barbara’s secrets may well come to light and what happens sets off a chain of events that impact heavily on Helen. The first part of the book is more a family drama as Barbara finds out that she is ill. Helen rallies round whilst also dealing with her own marital issues. I must admit that at this point the story wasn’t quite what I was expecting (although not in a bad way). 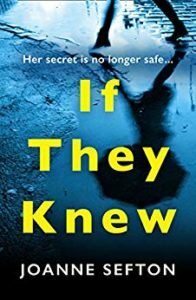 However, the second part is where it steps up a gear and those secrets start to be revealed slowly to me as the reader, if not to Barbara’s family. The story is mainly set in 2017, but there are chapters that go back in time to various different years. The story in the past isn’t told linearly so if you struggle to keep up with having a muddled timeline then this book may not be for you. I, on the other hand, absolutely love a book that throws me around and drip-feeds me the story. It’s like putting together a jigsaw. I really liked how the story in the past unfolded and the dawning realisation of what had happened was revealed. The author’s bio says she has a slightly bizarre interest in motorway services and indeed, they do appear in this book. Part of the book is set when motorways were starting to be built and it added a really interesting social history element to the story. I thought If They Knew was an accomplished debut novel, with a complex plot and interesting characters and I enjoyed reading it very much. Joanne Sefton lives in Bath and as well as writing, she is a working barrister and mother. She is Scottish and has an MA in creative writing from Bath Spa University.